Electric Mr Pea Sheller Review Is the Electric Mr. Pea Sheller right for you? This in depth Electric Mr. Pea Sheller Review of the pros and cons can help you make an informed decision. This is the base model for electric pea sheller machines. The Electric Mr. Pea Sheller is great for medium to larger gardens, or for those who just want a quicker way to shell peas. The Electric Mr Pea Sheller machine is very compact. In fact it could be said that it is a "coffee table pea shelling machine," rather than a table top pea sheller. I have not done a side-by-side comparison test (future peas sheller review article), but I'd say the comparatively small Electric Mr. Pea Sheller can do nearly as much as a Taylor Pea Sheller. Well, only because you can run only so many beans through by hand at a time. 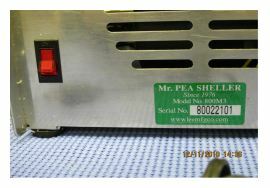 Peas need to be fresh and green to work properly in the Electric Mr. Pea Sheller. 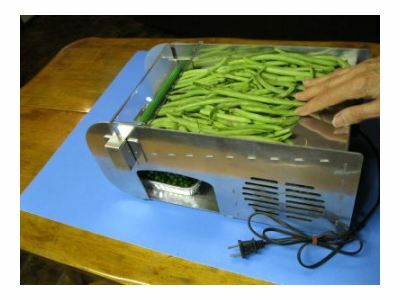 Usually spreading the pea pods out on a sheet or blanket and leaving them for six to eight hours (or overnight) will give the best results when shelling with the Electric Mr. Pea Sheller. Since the Electric Mr. Pea Sheller runs a lot faster than the hand crank Mr Pea Sheller, you will want to make sure the peas are properly prepared. The Electric Mr. Pea Sheller machine comes fully assembled. Just minutes after you get your Electric Pea Sheller machine home, you'll be ready to shell. The Electric Mr. Pea Sheller is very simple to operate. You simply spread the peas out in the slanted bin on top of the pea sheller. This slanted bed makes it easier to slide the peas in to the rollers. Once the peas reach the rollers they will be pulled through on their own. The peas will be deposited below the rollers in to a pan that comes with the machine (or your own pan that will fit in to the cubby hole). The pods will be ejected out the other end in a stack for easy clean up. The Electric Mr. Pea Sheller is designed to be operated by one person, and from our experience adding any more does not really improve performance. Being made of Aluminum, the new Electric Mr. Pea Sheller, is very sturdy and will not break down for a long time. It is not uncommon to find the electric motor inside the pea sheller will run for 20+ years before needing to be replaced. With the new upgrade in the outer case, there has also come an on/off switch. This means the electric Mr. Pea Sheller can remain plugged in and not running, a huge improvement over the older versions which had to be unplugged to turn off. There is even a very quiet cooling fan inside the pea sheller to ensure the motor does not overheat. I also consider how quiet this electric pea sheller is compared to the larger pea shellers a huge advantage. I happen to have a dog that hates when I vacuum or any loud noises, running this pea sheller did not even cause him to lift his head. With the Electric Mr. Pea Sheller being so compact it is easy to put away for storage until the next shelling season. The larger electric pea shellers are not easily put away. This pea sheller however, can simply be tucked away in the back of a closet and left until it needs to be used again. This is a huge advantage if you find you need a little more room in your work area. One thing that has carried over from the previous version of the Electric Mr. Pea Sheller, and found on the hand turned Mr. Pea Sheller, is the rollers. The splined feature allows the rollers to self-adjust to the size of peas and add more torque as the pods pass through. This self-adjusting feature helps to open the side of the pods and allow the peas to pop free. A few notes on safety with the new and improved Electric Mr. Pea Sheller. The electric motor for this pea sheller is completely enclosed inside the pea sheller. Meaning nothing can get caught on the belt that turns the rollers. The second major note on safety is the addition of a safety shield. Your hands can no longer get close enough to the rollers to get pinched by them. This sheller does not suffer from jamming that the smaller hand style sheller can, it will however mash more peas than the hand sheller does. With properly prepared peas only a small portion of the peas should be mashed. If you have problems with a lot of peas being mashed by the pea sheller, letting your pea pods dry longer should reduce the problem. The large amount of green gunk and buildup on the rollers is the pea pod case, not the peas being mashed, be careful not to jump to that conclusion when you first see the rollers covered in green pieces. The hand guard for the Electric Mr. Pea Sheller does not prevent pea pods from going over the top of the rollers. As pea pods are pushed down toward the rollers if they stack up, one on top of another, the ones on top have a tendency to go over the top of the rollers, meaning they are not shelled. This can be prevented by simply rolling your hand back and forth over the pea pods, to make them all one level high, and then pushing them down toward the rollers.